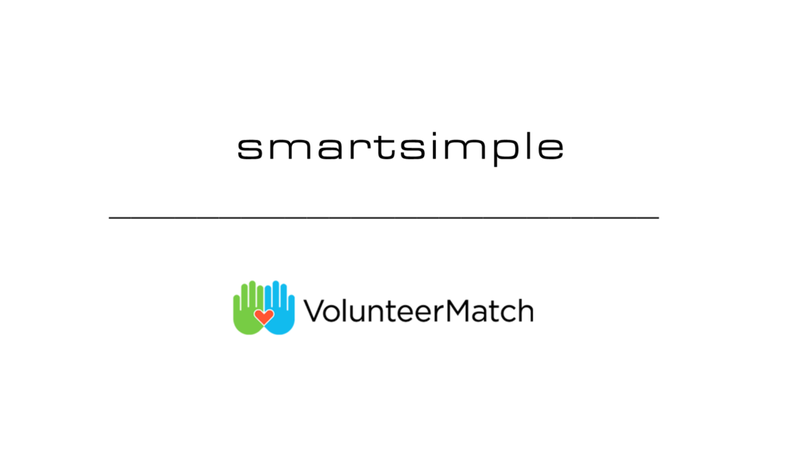 SmartSimple connects the web’s largest network of volunteer opportunities with its all-in-one CSR solutions with the new VolunteerMatch Network integration. It’s now easier to scale your employee volunteer program with over 100,000 volunteer opportunities right at your fingertips while empowering your employees to find the opportunities they feel most passionate about. The current and future trends of corporate philanthropy are in the hands of the employees. And the numbers and demand for employee volunteer programs are only growing. CECP’s 2018 Giving In Numbers report found that in 2017, the average employee volunteer participation rate was 30% (participating for at least an hour of company time). Between 2015 and 2017, a matched set of 87 companies reported an increase in their participation rate from 32% to 34%. Yet, what does this good news mean for program administrators? More headaches. Not only does the rising interest in workplace volunteering mean the need to source, vet, and maintain volunteer opportunities, but these same volunteer opportunities need to be aligned with the interests of employees to keep them engaged. Here’s where our new integration with the VolunteerMatch Network can solve both of these issues. VolunteerMatch is available as an add-on integration within SmartSimple Employee Giving and volunteer management solutions by providing a real-time database of over 100,000 vetted, real-time volunteer opportunities in every ZIP codes in the US (and some international regions) all from over 117,000 nonprofits. This extensive database also includes over 5,000 virtual volunteer opportunities that can be fulfilled remotely and 47,000 skills-based opportunities. This integration will save administrative time by already doing the heavy lifting of vetting and compiling volunteer opportunities while empowering employees to connect with opportunities aligned with their skill set and passions. Volunteer participation goes hand in hand with employees’ availability of options. The maximum average number of types of volunteer programs with some level of flexibility in employees’ schedules were the ones that attained the highest volunteer participation rate (33.5%) when offered together (Flexible Scheduling and Paid-Release Time). By adding VolunteerMatch Network integration to SmartSimple’s all-in-one Employee Giving and volunteer management systems, your employees have access to greater choice in opportunities and causes to volunteer their time towards. By giving your employees more ways to apply their skills to causes most meaningful to them, they are empowered to choose a cause they are more passionate and committed to. Each opportunity in the network can be easily searched and filtered by cause area, skills required, and location to match the employees with the most applicable and meaningful opportunities. Employees of companies using SmartSimple with VolunteerMatch Network integration can then connect with the nonprofits with the opportunities they are most passionate about. Allotting volunteer hours during on-company-time pays off in terms of reaching a higher commitment among employees. Employees will be more likely to participate in workplace volunteer programs if they don’t have to sacrifice their personal time and they feel their employer supports their passion for the causes important to them. Regardless of what type of volunteer program policy companies stated they had, companies able to report only outside-company-time volunteered hours obtain and capture a smaller average volunteer participation rate in 2017 (12%). This compares to companies with the ability to capture only on-company-time volunteered hours and which attained an average volunteer participation rate of 32%. The success of on-company-time and outside-company-time volunteerism greatly depends on companies’ ability to record the total number of volunteered hours by employees. Clearer procedures of this type of tracking will help determine better strategies to maximize the effectiveness of these programs and how engaged their employees, departments, and branches are. Our flexible software transforms how companies manage, track, and measure the full impact of your employee volunteer programs. Pushing the limits on the most complex process challenges in corporate responsibility and philanthropy, Our all-in-one solutions deliver innovative, client-centric solutions that strengthen your triple-bottom-line an impact in communities. With SmartSimple, you control every step of your volunteer management practices in a single, cloud-based platform while eliminating manual and repetitive tasks. In addition to VolunteerMatch, SmartSimple also integrates with other enterprise software you may be using, including financial, HR, CRM, and ERP systems. Want to take your employee volunteer program to the next level? contact us today for a demo of our all-in-one CSR solutions with VolunteerMatch’s integration to better engage your employees through your volunteering programs.